For the film, see Jindabyne (film). Jindabyne is a town in south-east New South Wales, Australia that overlooks Lake Jindabyne near the Snowy Mountains, in Snowy Monaro Regional Council. It is a popular holiday destination year round, especially in winter. This is due to its proximity to major ski resort developments within the Kosciuszko National Park, including Thredbo, Perisher and Charlotte Pass. Originally situated on land that is now under Lake Jindabyne, the township was transferred to its present location in the 1960s due to the construction of Jindabyne Dam, on the Snowy River, as part of the Snowy Mountains Scheme. At the 2016 census, Jindabyne had a population of 2,629 people,. The town's name is derived from an aboriginal word meaning "valley". Jindabyne is one of the highest settlements of its size in Australia, at 918 metres above sea level. Light snowfalls sometimes occur during winter. In mid-July in 2004 and 2005, snow fell up to half a metre following freak snowfalls over a large area of New South Wales. Jindabyne is connected to the surrounding area by Kosciuszko Road & North via Canberra, the Alpine Way West to the Riverina and Wodonga and the Barry Way to the South and Gippsland. Originally situated on a site that is now under the waters of Lake Jindabyne, the township was relocated to its present position in the 1960s before the damming of the Snowy River as part of the Snowy Mountains Scheme. The Scheme was developed from the 1940s as a way of increasing the flow of inland rivers in order to encourage the development of primary industries based on irrigation, and to create hydroelectricity. Completed in 1967, Jindabyne Dam is a major dam, located approximately 2 kilometres (1.2 mi) south south-east of the relocated township. Parts of Old Jindabyne can be seen when the levels of Lake Jindabyne are low particularly the foundations of the old St Columbkille Roman Catholic Church. The settlement of East Jindabyne is located above what was Old Jindabyne. The dam's main purpose is for the generation of hydropower and is one of the sixteen major dams that comprise the Snowy Mountains Scheme, a vast hydroelectricity and irrigation complex constructed in south-east Australia between 1949 and 1974 and now run by Snowy Hydro. Jindabyne celebrated the new town's 50th anniversary on 19 December 2014  with a long lunch, parade through the town centre, and speech by Peter Hendy MP. The celebrations were attended by His Excellency, General David Hurley, Governor of New South Wales, Member for Monaro, Mr John Barilaro, Mayor of Snowy Mountains Shire, Mr John Cahill. Jindabyne is a service town for Australia's highest ski resorts: Perisher, Thredbo and Charlotte Pass. Thredbo and Perisher are approximately 30 minutes' drive into the Kosciuszko National Park, although require the payment of park entry fees (AU$29 per vehicle per day) and the compulsory carrying of snow chains in winter for cars without 4WD. However, Jindabyne also attracts tourists in summer with Lake Jindabyne popular for activities such as fishing, water skiing and wakeboarding. Since the late 2000s mountain biking has become a popular summer activity and as of 2016, is assisting in turning the Snowy Mountains into a year-round adventure-tourist destination. The town is heavily tourist-oriented with a large range of snow-sport rental outlets and accommodation facilities. Prices can be heavily increased during the peak winter season, although they generally remain lower than those of outlets within the national park and ski resorts. Lake Jindabyne is a sailing, walking and fishing destination. The body of water is one of the largest fresh water reservoirs in New South Wales, and has a resident population of Atlantic Salmon, Brook Trout Brown trout and Rainbow Trout. Lake Jindabyne also has a reputation as one of the best places to catch trout in Australia. The Gaden Trout Hatchery, located about 10 kilometres north-west of Jindabyne, on the route leading to Perisher Ski Resort, holds tours of the hatchery's trout ponds, and is one of Australia's main centres involved in the breeding and rearing of cold water sport fish. Access to information regarding current tourist activities, business listings can be found using the area's free mobile app, the "Jindy Guide". Jindabyne has a cool oceanic climate (Cfb) with some continental influence. Diurnal range is high, especially in the summer. Rainfall is moderate and is equally distributed throughout the year. Snowfalls are common in the region. 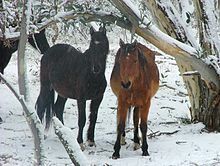 Wild brumby horses, in snow near Jindabyne. Jindabyne Central School (public) and Snowy Mountains Grammar School (private) serve as the town's educational facilities. Jindabyne receives five free-to-air television networks including all the digital free-to-air channels relayed from Canberra, and broadcast from Jindabyne Hill. Snowy Mountains TV is also broadcast from the same location, and operates in addition to the other broadcasters under an open narrowcasting licence. The Song Farewell Jindabyne was included on the 1966 The Settlers album, The Settlers Sing Song of the Snowy Mountains. The song Jindabyne was a single released by Rolf Harris in 1972, on Columbia records. It refers to the old town now beneath the lake. The 2004 Somersault was filmed in the town. The 2006 Australian drama film Jindabyne directed by Ray Lawrence was filmed entirely on location in and around the town. It stars Gabriel Byrne and Laura Linney. The song Around Jindabyne was performed by John Williamson. Destination Jindabyne is a locally developed initiative and website in partnership with the Jindabyne Chamber of Commerce with current and regularly updated business information and for tourists making plans to visit the town and Snowy Mountains in winter and summer. ^ a b Australian Bureau of Statistics (27 June 2017). "Jindabyne (State Suburb)". 2016 Census QuickStats. Retrieved 7 July 2017. ^ "Jindabyne". Geographical Names Register (GNR) of NSW. Geographical Names Board of New South Wales. Retrieved 11 October 2009. ^ "Highest Cities, Towns and Villages in Australia". maps.bonzle.com. ^ "Snowy catchment". Office of Water. Department of Primary Industries. 14 February 2012. Retrieved 10 May 2013. ^ "Why you should head to Lake Jindabyne before it's too late". australiantraveller.com. 18 May 2017. Retrieved 20 March 2019. ^ "Towns: Jindabyne". Snowy Mountains. Tourism Snowy Mountains. 2012. Retrieved 10 May 2013. ^ "Jindabyne celebrates 50th anniversary of the opening of the new township". Australian Broadcasting Corporation. 19 December 2014. Retrieved 23 February 2015. ^ "Speech on 50th anniversary of new Jindabyne". Peter Hendy. 19 December 2014. Archived from the original on 23 February 2015. Retrieved 23 February 2015. ^ "Jindabyne Area". Destination NSW. Retrieved 22 May 2013. ^ "Lake Jindabyne. Snowy Mountains. NSW". Sweetwater Fishing Australia. Garry Fitzgerald. 2004. Retrieved 10 May 2013. ^ "Gaden Trout Hatchery". Kosciuszko Alpine Way. Kosciuszko Alpine Way. Retrieved 24 July 2014. ^ "Climate statistics for Jindabyne". Climate Data. Retrieved 6 April 2017.